Six-time NASCAR Sprint Cup Series champion Jimmie Johnson survived a marathon rain delay to score a late-race victory in Saturday night’s rain-delayed SpongeBob SquarePants 400 at Kansas Speedway. Johnson gambled on pit strategy, staying out on the final caution on Lap 257 of the 267-lap race in his No. 48 Hendrick Motorsports Chevrolet. With the victory, Johnson became the first three-time winner in the NASCAR Sprint Cup Series this year. The triumph was Johnson’s 73rd in 482 career Cup starts, all with Hendrick. And after a few early-season stumbles, Johnson has finished in the top three for five consecutive races, with two of his three victories in that stretch. "A long, hard night of racing and fighting for track position," Johnson said. "And once we were able to get up front, we were able to hang on for the final laps." 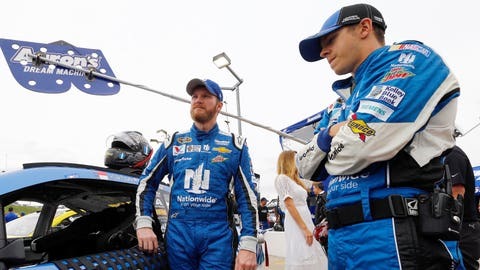 If Johnson keeps this up, he could tie or surpass the late Dale Earnhardt in race victories this year — Earnhardt had 76 — and Johnson could tie Earnhardt and Richard Petty if he wins a seventh championship as well. Kevin Harvick finished second in his No. 4 Stewart-Haas Racing Chevrolet, his eighth top-two finish in 11 races this year. Harvick was followed by Johnson’s Hendrick Motorsports teammates, Dale Earnhardt Jr. and Jeff Gordon. Joey Logano completed the top five. In five races on 1.5-mile tracks this season, Johnson and Harvick have won them all. Harvick led most of the closing stages of the race, but elected to pit with 10 laps to go while Johnson, Earnhardt and Gordon all stayed out. "We were in a bad spot leading the race there," said Harvick, the reigning series champion and points leader. "The 48 (Johnson) and 88 (Earnhardt) had nothing for us on speed. They were just doing what they had to do on track position-wise, then moved all over the racetrack to try and get air off our car. The good news is, we have a lot of speed in our car." Logano started from the pole in his No. 22 Team Penske Ford, with Kasey Kahne and the No. 5 Hendrick Motorsports Chevrolet on the outside of Row 1. Logano led the first 29 laps, then got passed in short order by the Stewart-Haas Racing Chevrolets of Kurt Busch and Harvick, the two drivers who have combined to lead 45 percent of all laps run so far this season. Busch led until Lap 50, when Harvick decided to move out front. Six laps later, Martin Truex Jr. took over the point and drove away from the field. After a Lap 95 caution for Jeb Burton’s spin, rain began and NASCAR threw the red flag, which lasted 2 hours, 16 minutes and 39 seconds. When the race restarted on Lap 108, Truex and Harvick quickly gapped the field. "They had the most raw speed," said Johnson’s crew chief, Chad Knaus. David Ragan spun his SpongeBob-sponsored car right on top of the SpongeBob logo in the middle of the tri-oval, bringing out another caution on Lap 121. Under yellow, Brad Keselowski, Carl Edwards and Denny Hamlin stayed out to take over the top three spots, with Truex the first driver to pit coming out fourth. 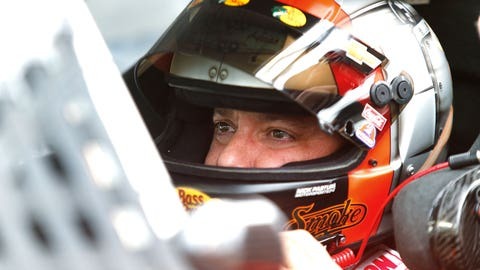 The race restarted, only to have another caution when Matt Kenseth spun at the exit of Turn 2 on Lap 130 and Tony Stewart got rear-ended by Brett Moffitt. Once the green came out, Keselowski pulled away from Truex, who in turn was pulling away from the cars behind him. Keselowski led until Lap 164, when he had to pit for fuel and tires. After the stops cycled through on Lap 180, Edwards led Keselowski briefly, but Truex quickly went back out front. Rookie Erik Jones ended his weekend with a spin on Lap 197, with Truex still out front ahead of Kyle Larson and Gordon. After Jones went around, his Joe Gibbs Racing teammate Hamlin did likewise to bring out another yellow on Lap 208. This time, Larson won the race off pit road over Harvick, Johnson, Paul Menard and Truex. When the green came out on Lap 212, Harvick muscled his way underneath Larson and into the lead. Ten laps later, Truex took second from Larson and set off in pursuit of Harvick. With 12 laps left, Ricky Stenhouse Jr. banged the wall to send the track yellow again, setting up the decisive move of the race. Harvick and about a third of the lead-lap cars pitted, but Johnson stayed out to take the lead over Earnhardt, Busch, Gordon, Truex and Harvick. The track went green with six laps to go, Harvick immediately moving to third place behind Johnson and Earnhardt. Harvick took over second with four laps to go, but he had nothing for Johnson. "It just dawned on me: We’ve won two races, we’re locked in the Chase, points don’t matter. We’re going for the win," Johnson said. "It was just sort of a gut feeling, split-second." Harvick still extended his points lead over Truex heading into next week’s All-Star race at Charlotte. Johnson is third in the standings as he chases another title. "In some ways we fought really hard to get to victory lane, but it’s also fun to win gambling," Johnson said. "We haven’t really gambled to win one." Truex led a race-high 95 laps, but his pit decision proved costly. Without fresh tires, one of the strongest cars in the field faded on the final restart and finished ninth. "Really hate when it comes down to fuel mileage. It seems like I’m always at the wrong end of that deal," he said. "It would have been fun to see whether we had anything for him." One of the bright spots all night was the heady driving of Jones, who made his first Sprint Cup start in the No. 18 while Kyle Busch continues his recovery from a broken leg. Jones spent most of the night near the front, even passing his idol Gordon with a daring move in front of the grandstand. 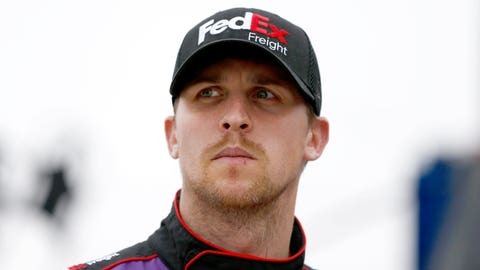 But a bobble of his own doing with 72 laps left sent him sliding head-first into the wall, and Jones wound up finishing the race 25 laps down. "I learned a lot, racing up front, racing with these guys," said Jones, who was running in the top five when he wrecked. "Just got loose and lost it. All my fault. Guess I have to go back and figure it out. But I’m ready to do another one. I hope I get another shot at it."